Wondering what Frankenstein is doing more than a month before Halloween? Well, it’s his special day this month! Yes, August 30th is officially Frankenstein Day, which is also the birthday of Mary Shelley, the author of the book. The story goes that Mary Shelley and her friends had a contest about who could write the best horror story. After thinking and thinking for days, 18-year old Mary finally dreamt of a scientist who created a monster and then regretted it. This turned into the plot of Frankenstein, one of the most read horror stories of all time. So what are we going to do this Frankenstein Day? Why, make Frankenstein crafts of course! We’ve got a list for you here, making use of various materials in your craft stash. Make sure you have lots of black and green of everything, and you’re all set! 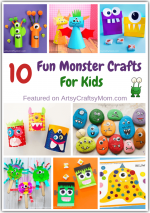 Here is the easiest Frankenstein craft ever! 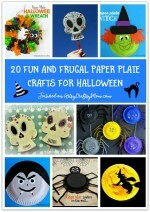 With a paper plate and green and black paper, you’re all set for your own friendly little monster! A great activity for toddlers from Glued To My Crafts. Nearly everyone has Popsicle sticks in their craft stash, so it shouldn’t be too hard to make this cute craft from This Girl’s Life! With sharpies and googly eyes, you can make this craft in a really short while. Add magnets to the back and make many to gift your friends! Put those brown lunch bags to good use by making a Frankenstein out of them! Paint the bag green and you have your canvas ready to make your Frankenstein as friendly or as mean as you want him to look! Get the details at I Heart Crafty Things. As we approach Halloween, a Frankenstein sun catcher is ideal to set the mood! This craft at From ABCs to ACTs is really easy although cutting and sticking the border may need some assistance. All the sticking is super easy and can even be done by toddlers. Here’s another fun Popsicle stick Frankenstein craft from Crafty Morning – but this one’s also a puppet! 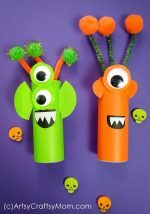 This craft is a fun collage-style project, and is good for middle-schoolers, who can make an assortment of creatures – who are too pleasant to be scary! We all love crafts that use recycled materials, don’t we? Well, here’s a cute Frankenstein craft from Cross Country Cafe that uses upcycled K-cups. 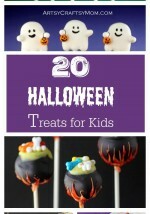 If you’re planning on having a Halloween party for kids, then this should make the perfect party activity! Speaking of recycling, how can we leave out tin cans? You Brew My Tea has a fun tutorial for upcycling tin cans to make cute Frankensteins – the use of the corks on the side is clever! This is a slightly messy activity, so it’s best to take it outside! Bet you weren’t expecting to see anything about Mrs. Frankenstein in this list of Frankenstein Crafts! Yes, this craft from Crafts by Amanda features both good ol’ Frankenstein along with his bride, who looks rather pretty! This craft requires a bit of detail work, so it’s good for the older kids. Tip: use small googly eyes for some more character. 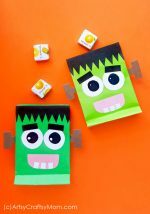 Here’s another idea for a kiddie Halloween party – Frankenstein Juice Boxes! Consumer crafts has a simple tutorial for how you can dress up regular juice boxes in fun ways. Go crazy with the hair styles and googly eyes for your own custom-style Frankenstein! Painting with different materials gives you some unique results and it’s great when you can customize your art with various techniques. 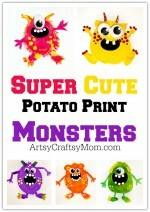 This puffy paint art project from Crafty Morning is so good, you’d think puffy paint was invented to paint monsters! There you go, lots of fun Frankenstein crafts making use of different materials, even recycled ones! The best part is you can change Frankenstein’s expressions and make him look silly, happy, angry or even sleepy! Go crazy with your supplies and have fun – unlike the scientist in the book, this is one creation you’re going to love!